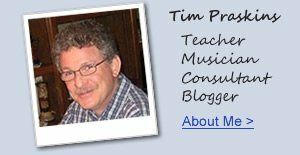 My name is Tim Praskins and as an expert digital piano consultant to many people throughout the world, I like to share my knowledge of digital pianos with people just like you. There are SO many choices when it comes to new digital pianos these days and people obviously want the best piano tone and touch they can get (with some other nice features) for the lowest price possible that fits within their budget. The variations of digital pianos can make it confusing because they can come in nice full size furniture cabinets, smaller slimline modern cabinets, lighter weight portable pianos with built-in speakers and optional manufacturer built stands & pedals, and also portable pianos with no built-in speakers. There are a number of digital piano configurations because people have different musical tastes and needs such as being used for home, church, school, stage, recording studio, gigging, or other venues. 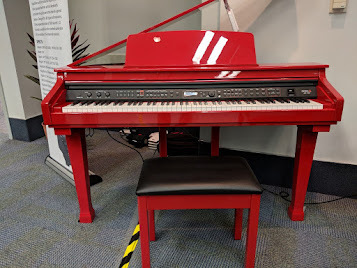 A variety of models from the top manufacturers including Roland, Kawai, Yamaha and Casio digital pianos are very good with a few being better than others. The Kawai ES8 portable digital piano (left pic - $1999US internet discount price - furniture stand & triple pedal lyre optional for $500 more) is one of my favorites for great piano sound and key action in a portable model along with flexibility to make it a very enjoyable piano own. The ES8 plays very smoothly with an organic piano feel and tone that even a pro can appreciate. I would consider the key action touch weight on this piano to be medium (as opposed to light or heavy) which gives the player excellent control over piano dynamics for the softest tone to the loudest...and everything in between. The ES8 is fairly easy to operate and has enough cool features for making music in ways that will enhance your overall playing and music enjoyment experience. 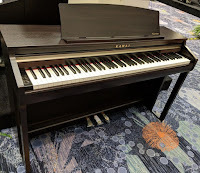 So if you want a more compact digital piano with good looks, excellent key action, piano sound, and pedaling along with some useful digital technology to help your playing, the Kawai ES8 would be my personal favorite under $2500. 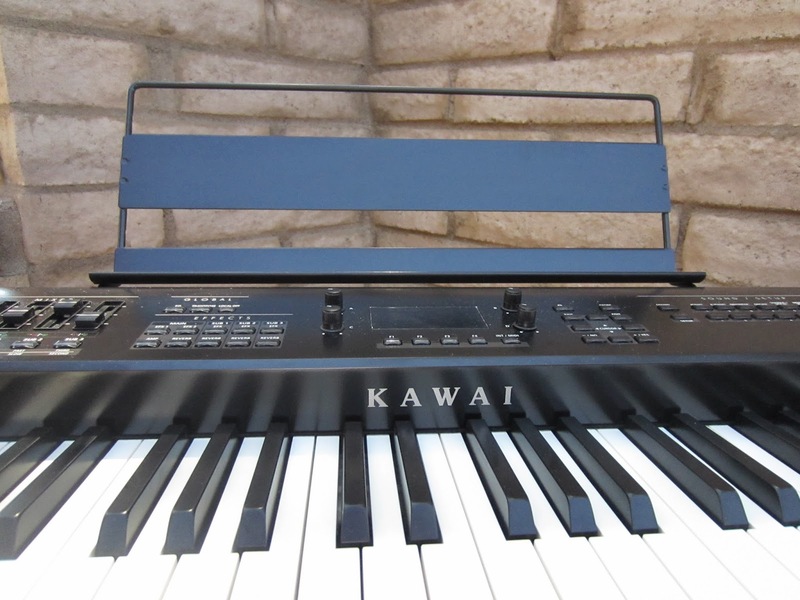 Kawai also makes a pro stage piano called the MP7SE which can also play back General MIDI song arrangements. This feature also allow the player to mute out specific instruments so that you can play those parts along with the song for full accompaniment enjoyment. The MP7SE is mainly built for superior grand piano tone and a quick realistic key action touch along with some very impressive instrument sounds including vintage electric pianos, symphonic strings, B3 jazz organs with digital drawbars, guitars, brass, flutes, synths, and more realistic instrument tones. And I am very particular when it comes to some of these sounds and the Kawai MP7SE certainly passes my test with flying colors. 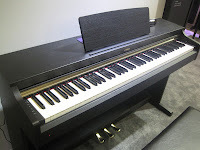 If you are an experienced piano player, advanced student, very particular in wanting an impressive piano tone & key action touch, or are a beginner and just want what the MP7SE has to offer (and don't care about cabinet and built-in speakers), in my opinion this would be the perfect digital piano in that "under $2500US price range" if you don't mind an instrument with no internal speakers and would need to connect to external monitors which makes it sound great. Below is a link to my review on the MP7SE with more details on this fine piano. Obviously this instrument is not in a cabinet so that can be a downside for some people and then you would need to look at something else like the ES8. 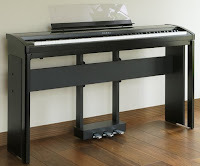 The Kawai piano company has a new and impressive furniture cabinet digital piano called the CA48 which is part of their Concert Artist series of home pianos. It comes in two matte finishes including matte darker brown-rosewood and matte black with the rosewood at $2099 internet price and the black at $2199 internet price. The CA48 has actual grand-piano style wooden piano keys (no one else has this feature in this price range) and a very realistic sounding acoustic piano tone using 192-notes of polyphony along with having many useful educational features in an attractive cabinet. This piano far surpasses anything that Yamaha has under $2500 at this point in piano playing authenticity and digital features. 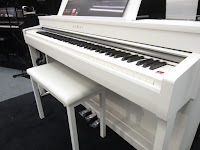 The CA48 also has very intuitive user controls for the main functions of the piano when using a proprietary iOS (iPad/iPhone) app through wireless Bluetooth connectivity. When not using the app then the piano itself has a LED display screen to see what's going on when you press a button. With 4-speakers, 40 watts of power, and a beautiful cabinet design with front support legs and sliding key-cover, it's hard to beat the CA48 for what it does and how it plays in its price range. 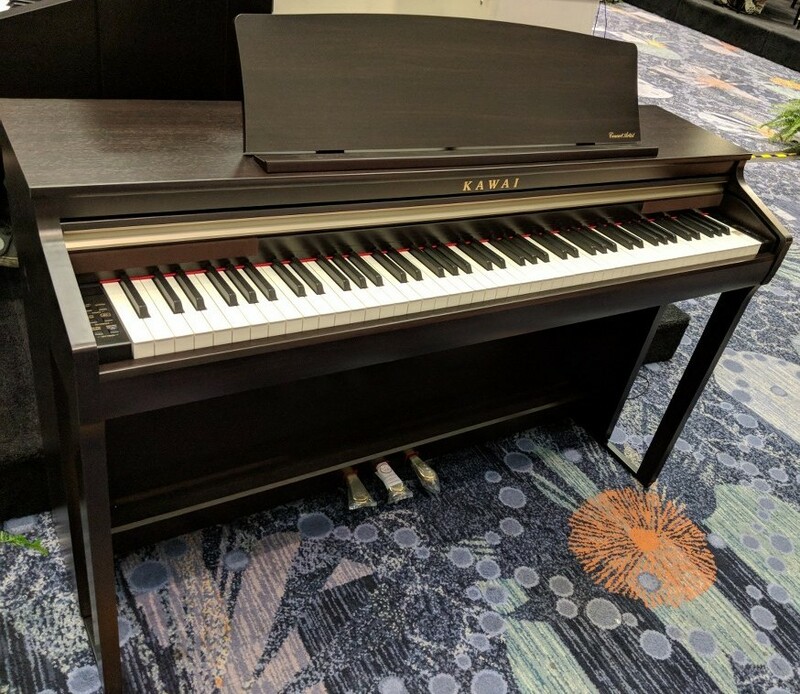 Kawai also makes another model called the CN37 (left pic in white) which has an internet/store discount price of $2599 for the basic rosewood color (satin black or white is $100 more). Even though this discount pricing is over that $2500 price range, it's close enough for "jazz," as musicians say:). 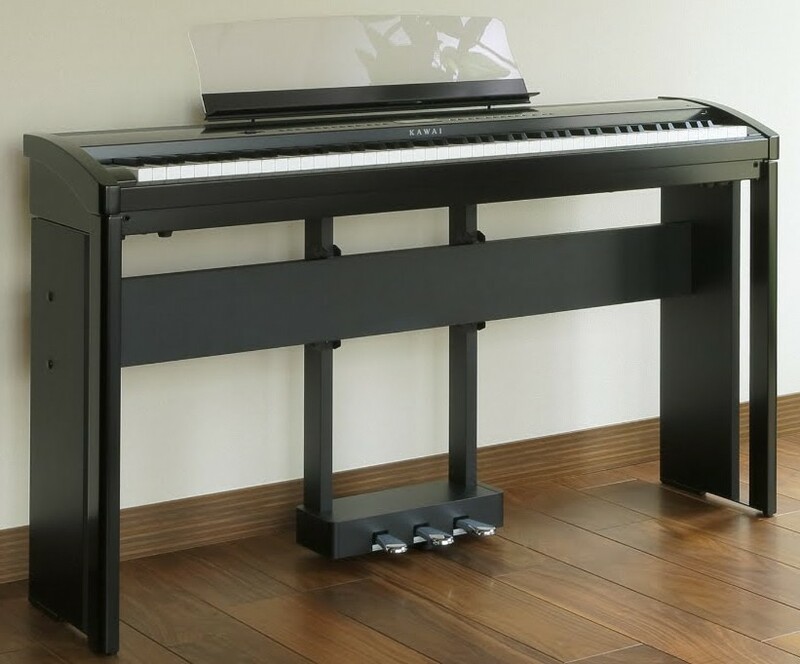 It's a great piano for someone who wants a good looking cabinet design, lots of digital features, helpful built-in educational software & functions, and a very smooth and dynamic piano hammer style (plastic, not wood) key action with realistic acoustic piano sound using a 256-note polyphony chip. This model also has 16-track MIDI playback & recording from a menu of 324 instrument sounds along with audio wav & MP3 recording & playback. So the CN37 has lots of things you can do with it and it sounds and plays good too. 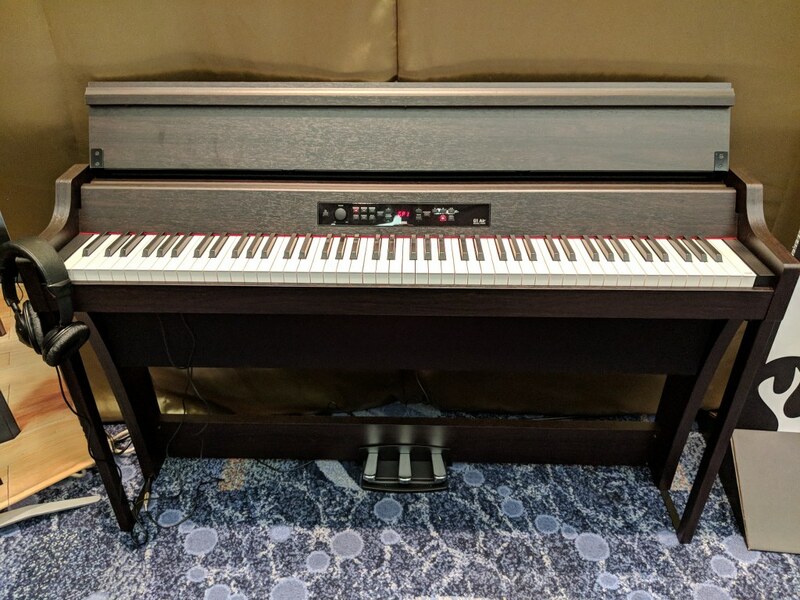 For a price very close to $2500, in my opinion the CN37 offers a very good bang for the buck in this price range for a traditional furniture cabinet model digital piano even as compared to what Yamaha or Casio has to offer in that same price range. 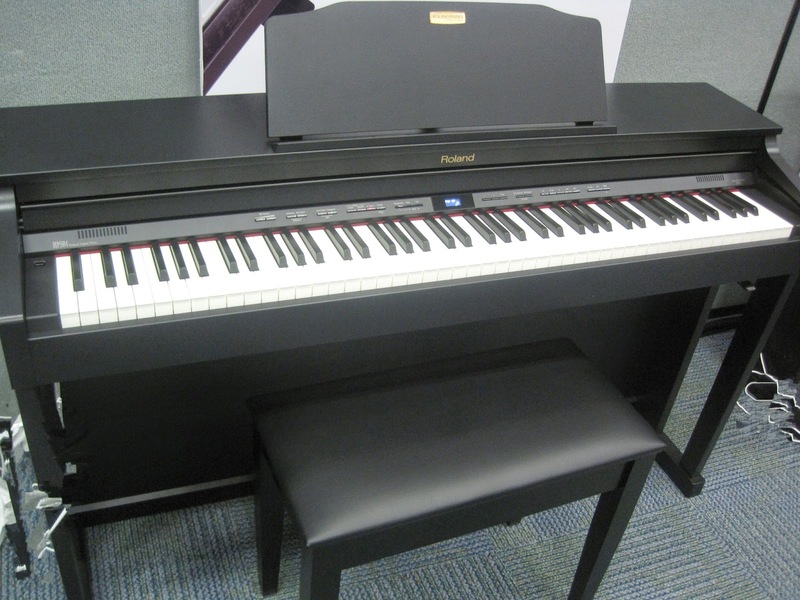 A person can spend a bit more than $2500 and have some other great piano choices such as the newest Roland HP603, Yamaha CLP645, Casio-Bechstein GP300, Samick NEO, and others. So there are plenty of very nice digital pianos for even more money, up to $22,000 for a few Digital Grand Pianos. But most families I speak with want to be under $3000, and any of these pianos mentioned here would be enjoyable to own. 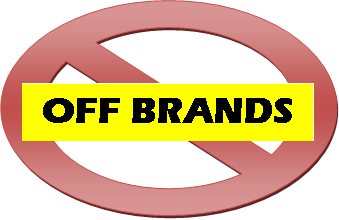 Based on my experience both past & present, I recommend that people stay away from the off-brand names like the Williams brand which is a Guitar Center house brand and is only sold by the Guitar Center company and it's subsidiaries. Also I would be careful with pianos from Suzuki & Artesia sold primarily in the US by Guitar Center & Costco. Most of these off-brands just don't qualify to called real "pianos" in my opinion. It's all about having realistic key touch action, proper dynamics, smooth key volume response, realistic piano tone up and down the entire 88-keys, no unreasonable key noise, and proper pedal response. 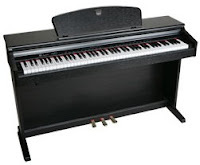 There are basic minimum standards that pianos need to have and these off-brand pianos usually fall short. Also, the off-brands or house brands (in many cases) are not actual piano manufacturers but simply created names produced by relatively unknown Asian factories with (what I consider to be) low quality technology and parts for a low price. Their names sound American to give you the impression that they are somehow as good or better than the Japanese brands, but they are not. They are all made in China and although generally speaking product being made in China is not an issue as far as I'm concerned because many of the top brands now have factories in China. It's what the product actually is, how it's made, the parts and construction that is used, and the quality control provided that counts. I have played all of the off brand pianos offered in the US that I have mentioned here and would not recommend them to anyone if they are looking for a good piano playing experience and long term investment (no matter what the price is). 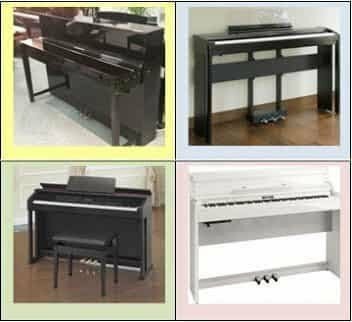 The piano cabinets themselves, extra sounds, and other features offered in these digital pianos are only important if the primary functions & features of the piano passes the test. 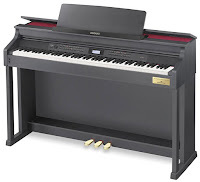 Low price and an attractive furniture style cabinet alone is definitely not a good way to judge piano quality, although unfortunately many people do. You will likely purchase a piano that you'll want to keep for a while so be sure you do your homework and get something that is a good instrument from one of the name piano brands, you'll be glad you did. One of the more surprising digital piano options to me under $2500 is the Casio Celviano AP700 digital piano which sells for $2499US discount price on the internet. 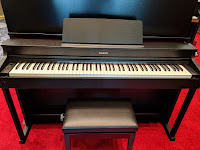 Not only does this piano look great in its upgraded furniture cabinet, but I was impressed by how good it plays & sounds as a piano along with the useful digital features it offers. The AP700 has a powerful built in stereo sound system which does a very good job projecting its piano sound in a way that makes you feel like you are playing a large acoustic piano. The AP700 piano sound technology comes from Casio's higher priced and more advanced Grand Hybrid models with a store price of approx $4000. So the piano sound reproduction you get out of the AP700 is the same as what you would hear in the more expensive models. The user interface is fairly easy to use and see located directly in front of you above the keys. 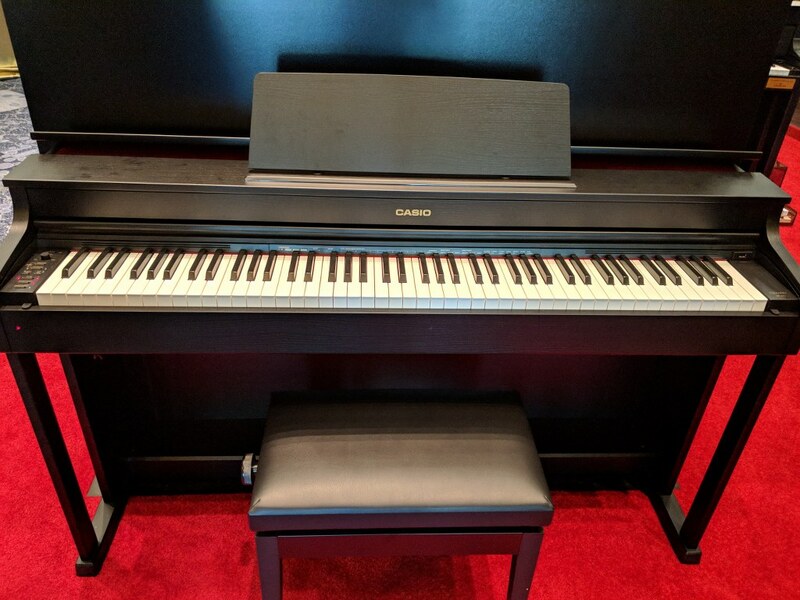 So when it comes to a full furniture cabinet style digital piano for less than $2500 but still above $2000, I would pick this Casio AP700 as offering the "best bang for the buck in a traditional furniture cabinet" under $2500US. I know it's difficult for most people to judge these various brands and models on their own when they don't have the experience & expertise. It can also get even more confusing when different piano and music instrument stores tell you different things depending on the brands they're selling. That's why I am happy to help people who wish to contact me and I will answer your questions about what might be best for you based on the actual facts about what these pianos can actually do and what you budget and musical goals are. 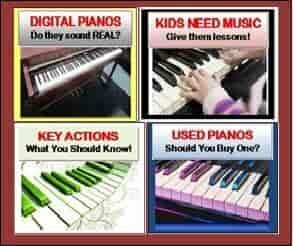 Even though the choices I have talked about here for my top digital piano picks are good ones, there may be other options for YOU depending on your particular price range and specific needs & wants. I am committed to helping people get good digital pianos, playing good music, having good piano instruction, and enjoying the entire experience . I don't work for piano manufacturers nor do I have a favorite brand or model not do I link you to Amazon to purchase a piano just so I can make an affiliate commission off of your sale. I do it because this is my passion and I care about your (and your family's) musical well being. Go to the link below to see what music involvement should be like in the lives of children and why you should should get your children and/or yourself involved in music. Why Kids Should Play Piano! I am debating between a casio px-330..which is very affordable or a kawai ES-6...which I really like, but the the price is 3x higher than the casio...can you help me decide? 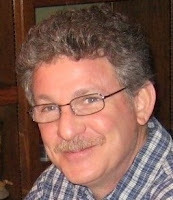 I really like your blog and find your reviews very helpful. I'm trying to work out what digital piano to go for. I've been looking at the Yamaha P95 for a while now. Can you tell me what you think of it (if you've played it that is)? Thanks for letting me know. I will check out the Casio model you recommend as well! Hi there, I am looking to buy a digital piano and was wondering what you thought of the Casio AP420 compared to the Casio AP 220. The cost of the 220 seems to be a bit less from the sites I've seen it advertised on, so I wasn't sure if the 420 was worth the extra money. The case seems a bit more sturdy on the 420 as well, and I know it has bigger speakers and an SD drive where the 220 does not, but as far as sound quality and other features, how do they compare? Thanks, T.H. I would be happy to answer your piano questions in detail if you email me directly and also indicate where you live. I found the info on your Casio 220/420 review, thank you for all the information! I am finding your blog very helpful as we are trying to decide best value for money and are new to the digital piano market. Potentially interaction with notation software. I was hoping for something around the $1000 mark to start with. Any guidance you can give would be fabulous. Any opinions on the Kurzweil RE-220? I'm looking to upgrade from our 20 yr old Korg Concert 3500 and have been offered the Kurzweil for $700.00 (Business closing). In general I'm looking for a "Piano" to expand my daughters 11 yr old "bells and whistles" that will also take her to the next levels Grade 5-8 royal conservatory. Any opinions on the Roland F-120, my 7 year old daughter is just beginning to learn piano. Any opinion on the Roland F-120, my 7 year old daughter is just starting to learn piano. The Roland F120 is a very basic, but nice instrument with some good features although the speaker/audio system inside is quite small which gives off a small sound in my opinion. Also, the key action is quite noisy when keys are pressed all the way down when pushing down the keys at a harder velocity. This is not an issue in the beginning but could become an issue later. A very "thumpy sound" when that happens. Otherwise a good option although there are others. You may email me for more info. I'm from Turkey. I'm confused so I need your advice. Which one is better? Yamaha Arius Ydp 141 or Cassio Ap420? Their price is equal where I live. So which one should I chose? My son is almost 11 and has been playing guitar for about3 years. He would now like to take up piano. Any recomendations on a digital piano for him. We are looking in the $200- $500 range. Could you give a recomendation on the low and high ends. I want to get a decent one that will keep him interested. Hello. As an apartment dweller, And someone who has gone back to playing after 40 years, I'm looking to replace my old spinet with a digital piano. I'd consider either a traditional or stage model. Is there an advantage of one over the other? I want the most realistic sound and feel, and will be using both speakers and headphones at times. What do you suggest? Thanks. I bought a Korg LP-350 recently. Just wonderring if you know about the loud bang noise when swith off the speaker? Not sure if it normal. There is sometimes a loud pop in instruments when the power is shut off but it would be difficult to know if what you're hearing is normal to that instrument. due to the budget i'm facing,the only digital i can get is between the Yamaha P-95,And the Casio CDP-120 or CDP-200R. i did a research and the i think the best for the feel and touch is the yamaha P-95 but for the features,i like the Casio CDP-200R better. Any good ideas? My 7 year old son has taken interest in piano and the teacher has asked us to look for one, either acoustic or similar key feel, sound with pedal action. 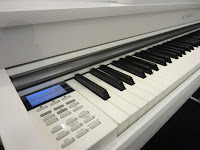 The nearby popular music shop have advised that Yamaha Clavinova's or the Roland F120 or better models to buy as they said are recommended by ABRSM. Obviously I want to buy a piano to kindle and sustain interest of my child and also something to help to practice for a few levels of the exams at some point. But, my question is are the less pricey models as Casio Celviano's or yamaha YDP's not good enough for the purpose and perhaps for a few years of learning to start with? Are you aware of such recommended models by ABRSM? What would you suggest considering the fact that my child may loose interest having tried. We live in UK. Thank you very much for your time. Would you be able to comment on Roland DP90S Digital Piano? Would you be able to comment on Roland DP90S Digital Piano? I have a very small apartment and this seems perfect. The piano is beautiful. I watched the video and sounds good. But is it really good? Your comment would be really appreciated. Thank you very much. Thank you for your informative site. I have a couple questions...1)I am curious about the expected life span of a digital piano. Resonably, at the rate technology advances, I know that these models at the top of the line today, will often be outdated in a few years. What do you feel would be among the most enduring models? 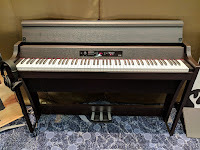 - about 14 years ago I bought a digital piano, and it has served me well (Technics brand)- it was not cheap and the 'hammer action' was just a very new feature available at the time. It was what helped me accept going digital. Compared to the digital pianos out there currently, it is not as precise in sound and touch but has still been very comparable over the years. I did notice last year though, that it seems to be somewhat - aged?? dying maybe?? It is actually gone off-key... 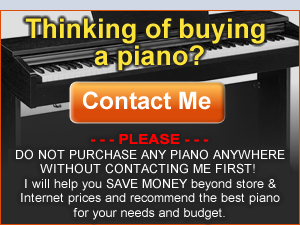 Which brings me to my 2nd question: I am in the market for a new digital piano. I teach piano privately - it is more something I love to do than a profession but I still don't just want beginner/intermediate student quality. My budget is not super high, but I am willing to spend a little more if it is really worth it - because I do want quality, realistic sound and feel and want it to last for quite a while. I also have used my piano for recitals so I want it to look and sound good in a bigger room also. I have played the Casio PX-130, 135 and 735 (even recommended it for some of my students - but for me personally, I'm looking for a little more than that. Additionally, if this affects your recommendations, I also want something that will record with good quality as I often connect my computer to the piano to make gift cd's for relatives and friends. (My current piano has an old midi connection that doesn't even fit with modern comptuers now - so I can only record directly from the headphone jack as I play... the sound transfers slightly tinny) Any recommendations to point me in a good direction? Tim, we live in Bahrain and are looking to buy a used Medeli DP 40 for our two kids, aged 11 and 12. We don't have a lot of affordable choices here but need to get them off the electric keyboard and onto something that feels more like a real piano. However, I don't want to waste our money. Can you tell me anything about this piano? After toying around for a while, I have decided on the Kawai CN34. Is it possible to generalize which digital pianos tend to have a lighter touch? I have owned Roland and Yamaha "slab" digital pianos, and have preferred the lighter touch of the Rolands. Now I'm looking to purchase a home digital piano, and I'm wondering if most players find that the Rolands have the lighter touch in that category as well. Thanks for your prompt response, Tim! tim,what do you think about nord piano 3?